September 13, 2010 - Zenith Aircraft Company's 19th annual Open Hangar Day and Fly-In Gathering is scheduled for Saturday, September 18, 2010, at the factory located at Mexico Memorial Airport in Mexico, Missouri. Aviation enthusiasts, especially builders and owners of Zenith Aircraft kit planes, are invited to drive or fly-in for the day. The Zenith Aircraft kit production facilities will be open for factory tours and Zenith's factory-demonstrator kit aircraft will be on display. Company staff will demonstrate kit production and fabrication techniques used in producing the all-metal kit aircraft parts made at the Zenith Aircraft factory. They will have a number of planned activities, including a series of hands-on educational and informative workshops for existing owners and builders, as well as new builders just getting started. Beginning on Friday afternoon the company will present several workshops in the factory, continuing with shorter seminars on Saturday morning. Back by popular demand, they have scheduled an informal "Zenith banquet" dinner and social gathering on Friday evening. Following are some of the participants and activities planned for the 2010 event. Starting on Friday afternoon, September 17, the following seminars have been scheduled. The presenters will also be available on Saturday to answer questions. A simple "hotdog and soda" lunch will be available at noon, compliments of AmZac Light Sport Aviation. Friday, September 17th From 12:30 - 2:00 PM ?Painting Your Homebuilt? Mike Loehle of Loehle Aero Coatings will discuss aircraft painting, with in-depth information on painting your Zenith aircraft using Loehle Aero Coatings high quality aircraft finishes. ?ULPower Engines? A&P mechanic / pilot Gus Warren will discuss and show you the new lightweight ULPower engines from Europe. ?Rotax Aircraft Eengines Workshop? presented by Dean Vogal. Learn all about the Rotax 912 series light aircraft engines, popular in the STOL CH 701, STOL CH 750 and the Zodiac series aircraft. Dean Vogel is a top-rated instructor in the Rotax Flying and Safety Club (RFSC), Vogal is a 1982 graduate of the USAF Academy, and he spent a total of 14 years in the Air Force maintaining and flying jets. Vogal then worked 13 years with Cirrus Design, helping to take the company from 10 employees to 850. Vogal has tremendous experience with maintaining and overhauling the Rotax engines that are popular in so many Zeniths and other Light Sport Aircraft. Vogal and his company, Aero Technical Institute, is the main training arm of Lockwood Aviation in Sebring, Florida. From 2:15 - 3:45 PM ?Jabiru Aircraft Engines? presented by Zodiac builder/owner Mark Stauffer of JabiruUSA. This informative workshop will cover everything you've always wanted to know about operating and maintaining the popular Jabiru aircraft engines, including the 4-cylinder Jabiru 2200 and the 6-cylinder Jabiru 3300. ?Garmin Avionics? Tim Casey, Garmin's sales manager for portables, LSA, and Experimental Aviation Markets, will present Garmin's GSX glass cockpit systems, and will be available to discuss and answer questions on installing and operating Garmin avionics in Zenith aircraft. From 4:00 - 5:00 PM - ?How EAA Can Help You Build and Fly Your Own Aircraft? Charlie Becker from the Experimental Aircraft Association hosts a seminar on EAA's available resources to help builders, owners and pilots of amateur-built aircraft, including the technical advisor and flight advisor programs, as well as details on Sport Pilot / LSA rules. ?Inspecting and Pre-Flighting your Zenith Aircraft? by Gus Warren. A&P mechanic / pilot Gus Warren will discuss and show you how to thoroughly inspect your completed Zenith aircraft prior to your first flight, and how to adequately preflight your aircraft before every flight. This seminar is highly recommended to all builders, owners and pilots of Zenith aircraft (especially second owners), and will include an actual inspection using an itemized checklist. (In front of the Zenith Aircraft factory). From 6:00 ? 9:00 PM - ?Zenith Builders Banquet at the Elks Lodge? (next to the airport). This is a fun and informal buffet dinner gathering of Zenith enthusiasts, builders, pilots and employees. Some great door prizes will be awarded. Saturday, September 18th From 8:00 am - 3:00 PM - The Zenith Aircraft kit production facilities will be open for factory tours and Zenith's factory-demonstrator kit aircraft will be on display. Company staff will demonstrate kit production and fabrication techniques used in producing the all-metal kit aircraft parts made at the Zenith Aircraft factory, including cutting and pre-drilling kit parts on the CNC router, forming and hand finishing wing ribs and other kit parts, and aircraft aluminum welding demonstrations. They will also have aircraft kits and parts on hand and special factory tours are planned. Saturday participants and activities includes hands-on workshops, visitors will be given the opportunity to "build their own" aircraft-aluminum binder for their Zenith documentation, as well as a custom made wheel chocks assembly project. Charlie Becker from the Experimental Aircraft Association will attend and host a seminar on EAA's available resources to help builders, owners and pilots of amateur-built aircraft, including the technical advisor and flight advisor programs, as well as details on Sport Pilot / LSA rules. Garmin Avionics, the leader in light aircraft GPS and avionics systems, will be on hand to show the latest Garmin products for light sport aircraft including the new GSX flight deck. Tim Casey, Garmin's sales manager for portables, LSA, and Experimental Aviation Markets, plans to attend to answer questions on installing and operating Garmin avionics in Zenith aircraft. Rotax aircraft engines, famous for its popular 100-hp Rotax 912 ULS engine, will be represented by Dean Vogal of Aero Technical Institute in Sebring, Florida. 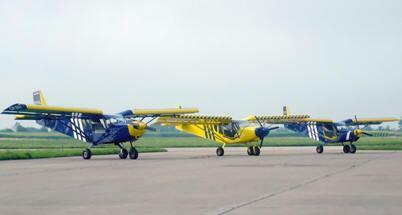 Gus Warren plans to fly in from Florida in a STOL CH 750 powered by a lightweight ULpower engine, and will be on hand to show this modern new European aircraft engine. Gus will also be available to answer questions about Sport Pilot and Light Sport Aircraft (LSA), and professional builder assistance. Mark Stauffer, builder and owner of a Zenith, will represent Jabiru USA, distributor of Jabiru engines, the line of lightweight aircraft engines popular in many Zeniths. Mark will be available to answer your engine installation, operation and maintenance questions. AmZac Light Sport Aviation is a new builder assistance center located in Mexico, Missouri. It was established to help builders get their kit project completed and flying sooner, and to provide kit assembly facilities to builders who do not have the needed space. Diane and Billy Carter from AmZac Light Sport Aviation will attend with their STOL CH 750 project to meet with builders and answer building questions. Jon Croke, editor of the "Zenair Newsletter," will be available to sell back issues of the newsletter, renew your subscription, and interview builders and suppliers for future issues of the builder newsletter. The official newsletter is published six times per year, and each issue comes with a companion DVD. Mike Loehle of Loehle Aero Coatings will discuss aircraft painting, with in-depth information on painting your Zenith aircraft with Loehle Aero Coatings high quality aircraft finishes. Dynon Avionics has sent the company a brand new glass panel SkyView demo unit which they will have mounted in a STOL CH 750 instrument panel, demonstrating this new next-generation glass panel with 10" display. Russell Lepre from FlightCrafters, a leading provider of professional builder assistance and quick-build kits, will attend to meet with builders and answer building and flying questions. Chuck Preston from Kitplanes magazine will be on hand to answer questions about the popular magazine dedicated to homebuilt aircraft. George Happ from Matco Mfg., maker of light aircraft wheels and brakes used on many Zeniths, will be on hand to discuss the company's products and how to best install and operate them on your Zenith. Viking Aircraft Engines makes a Honda-based 100-hp engine conversion for light aircraft. Jan Eggenfellner is planning to fly-in a Zodiac CH601HDS powered by one of his new conversions. Scott Wicks of Wick's Aircraft Supplies will hand out catalogs and showcase some of the builder supplies offered by Wick's (aircraft building materials and hardware, tools, and accessories). AeroLEDs, the latest LED (light emitting diode) aircraft lights, including wingtip mounted strobe / nav lights as well as an assortment of new landing lights.